The Angriest: Star Trek: Voyager: "Resistance"
It is 27 November 1995, and time for another episode of Star Trek: Voyager. "Resistance" opens with half of the Voyager bridge crew sneaking through an alien market. They are interrupted by masked soldiers: Torres (Roxann Dawson) and Tuvok (Tim Russ) are captured, Neelix (Ethan Phillips) escapes, and Captain Janeway (Kate Mulgrew) is shot. It is a hell of a way to open an episode; possibly the strongest one that Star Trek: Voyager has enjoyed to date. After the opening titles we get some badly-needed context. Voyager badly needs a substance called terellium to ensure the warp drives continue to function. They can get it from a nearby planet, but that world is controlled by the xenophobic and oppressive Mokra Order. This requires a covert mission to secure the terellium from the local resistance - a mission that has gone spectacularly wrong. Tuvok and Torres are now imprisoned awaiting interrogation, Commander Chakotay (Robert Beltran) is forced to go cap-in-hand to the Mokra leadership, and Janeway wakes up in the care of an elderly man (Joel Grey) whose dementia leads him to believe she is his long-missing daughter. The 'in media res' opening to "Resistance" really gives it the lift it needs to rise above the other episodes of Season 2. By the time the episode begins, Voyager is already in critical condition with a genuinely possibility that its warp drive will be permanently inoperable within an hour. It starts in a strong, dramatic place and does not leave it. The story is neatly balanced across three lines. In one, Chakotay negotiates from Voyager. In another, Tuvok and Torres resist torture and interrogation. 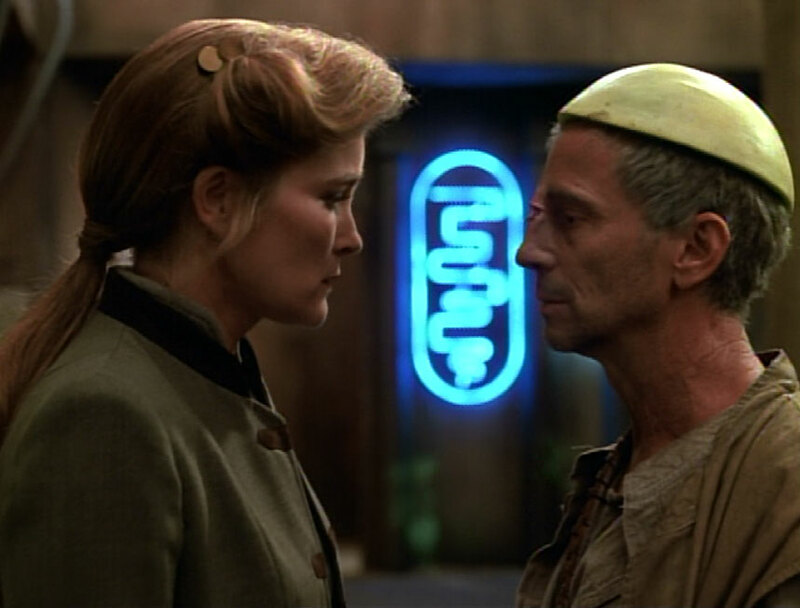 In the third, Janeway prepares to rescue her crewmates while struggling with the tragic, befuddled old man Caylem (Joel Grey). Joel Grey is a tremendous actor. He won the Academy Award for Cabaret. He has won the Golden Globe and the Tony as well. He delivers a superb performance as Caylem, giving the character not only a strong burst of humour but tremendously effective tragedy as well. Lisa Klink's teleplay teases out his back story piece by piece, which maximises its impact when his full situation and past become clear. He works very well with Kate Mulgrew as well, providing such a strong presence off which to play that she gives one of her strongest performances so far. The episode is very well balanced when it comes to the regular cast. Everyone has a job to do, and a moment to shine. This is the best episode of Season 2 so far, and the seventh good episode out of 12. The quality ratio rises to 58 per cent.